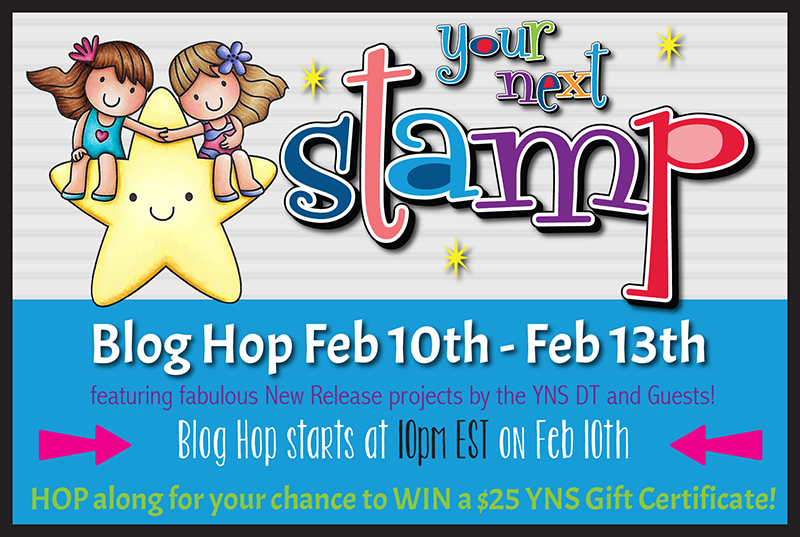 Hollybeary Creations : YNS February Release Hop!! Yay... It's time for the Your Next Stamp February Release and Blog Hop! Hop along with the team as we share a look at all the Fun new products that are now available in the store. Be sure to leave comments along the way for a chance to Win a $25 Gift Certificate to the store. 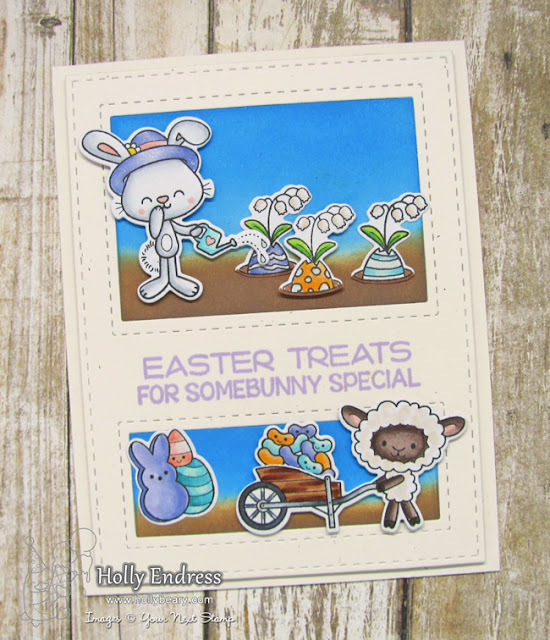 My first project features the new Window Panel die and Adorable Spring Treats stamp and coordinating die sets. I die cut the panel from some Naturals cardstock and then I added some Distress Oxide inks to the window pieces creating a background for my scene. I adhered the windows into the panel with some clear tape on the back and adhered the entire panel to a top folding A2 size card base with some foam adhesive. Before I adhered it though I stamped the sentiment from the same set in some Lovely Lilac ink. I stamped the images onto some X-Press it blending cardstock using the YNS Black Olive Ink and colored the images in with Copics. I die cut the images with the coordinating dies and adhered them to the front with a combination of liquid adhesive and foam adhesive to create varying heights. For a little extra sparkle, I added some Spectrum Noir Clear Sparkle pen over parts of the images. My second project is my Favorite... I love these new Chicks in the So Egg-citing set. I created a Distress Ink background on a piece of watercolor paper and added some dots with a stencil and embossing paste for a little texture. Then I adhered that panel to a A2 size card base. I die cut two banners using the Fishtail/Banner Die set one. I cut one from some Purple cardstock and heat embossed the sentiment in White and another from the new Fairytale Magic 6x6 Paper Pad. 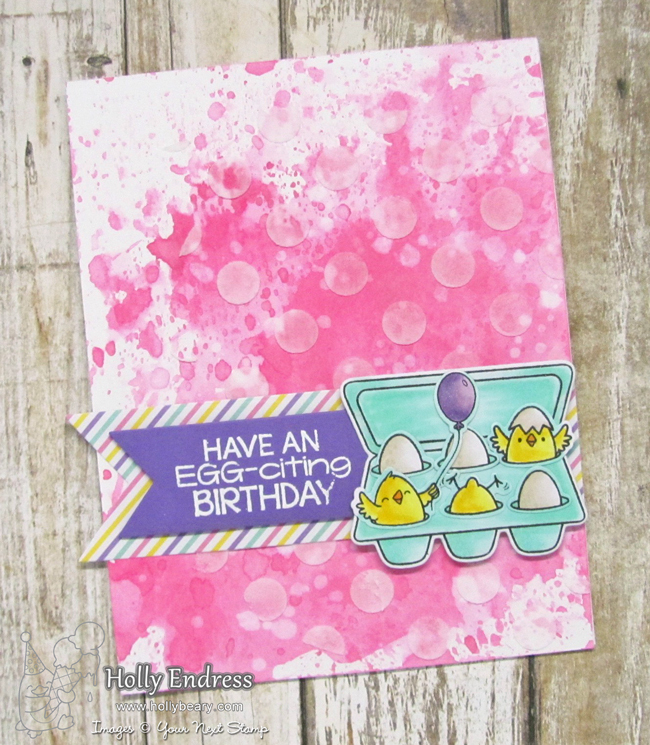 I stamped the egg carton with the chicks onto some X-Press It cardstock and colored the images in with Copics to match the colors in the Pattern paper. I used the coordinating dies to cut the images out and I adhered them over the banner. Are you ready to Hop along for some more great projects? See the list of Links below and we have a sale going on in the store too!! Such gorgeous spring products and the way you showcased them is brilliant! Beautiful cards! great cards Holly, I especially like the first one. Your distressed backgrounds are perfectly done to set the stage for your critters. Awesome job. Awesome release by YNS❤ both cards simple awesome!! Adorable cards. Love the background on the second one. Great cards, love those little chicks! I love your cards, so dang cute! Fabulous cards! I love your background and that sweet sweet image for you second card.... wonderful! Such sweet Easter creations. I really like the way you used the panel die - so cute. Your cards are adorable! I love the distressed ink background on the second card. 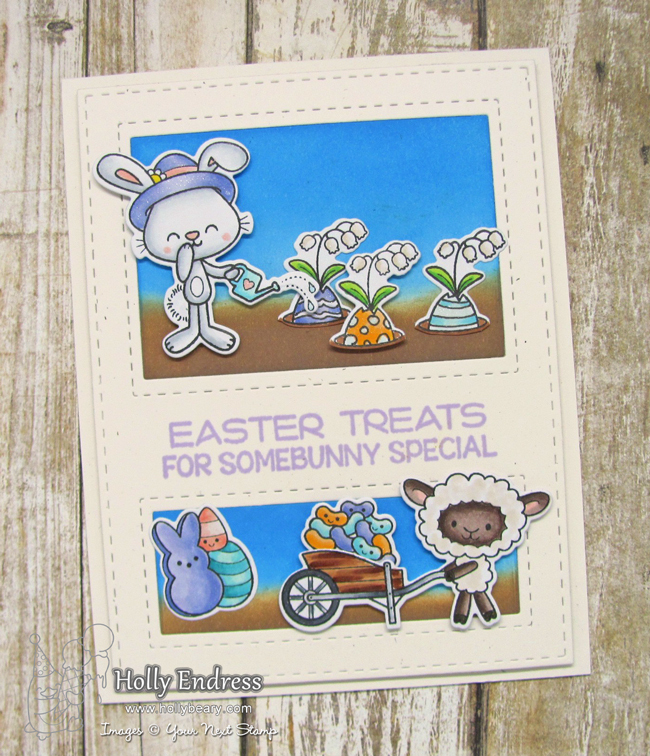 These easter cards are adorable! These are sooo adorable!! LOVE the bunny watering the Easter Eggs; too fun! images are just way too adorable for words. Fabulous cards! I especially love the gorgeous pink background on the second one! container of eggs is cute. Beautiful stamping. Love your cards. Fantastic cards! I love the backgrounds you created! These critters are so cute, growing their jelly beans and eggs. Love your second card. These are two absolutely fantastic cards ! Congratulations !